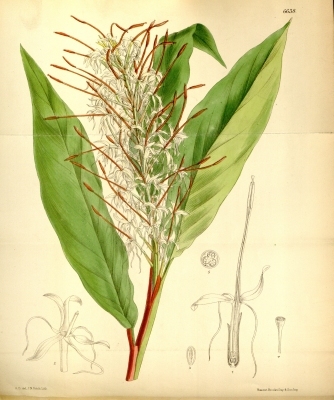 Hedychium gracile is a herbaceous perennial plant producing a cluster of erect stems around 60cm tall from a tuberous rhizome. The plant is sometimes gathered from the wild for local use as a spice. E. Asia - India, Bangladesh, Myanmar, Thailand. J. M. Dent & Sons, London. A concise guide to a wide range of perennials. Lots of cultivation guides, very little on plant uses. Scented Flora of the World. An excellent, comprehensive book on scented plants giving a few other plant uses and brief cultivation details. There are no illustrations. An excellent book for the dedicated. A comprehensive listing of Latin names with a brief list of edible parts. ]. No more details are given. ]. Prick out the seedlings into individual pots when they are large enough to handle and plant them out when large enough. ]. Dig up the clump and divide it with a sharp spade or knife, making sure that each division has a growing shoot. Larger clumps can be planted out direct into their permanent positions, but it is best to pot up the smaller divisions and grow them on until they are established.